The team at Social Media Examiner recently received a real gold mine of social media insight. It’s a mega report recently released by MarketingProfs called, “The State of Social Media Marketing.” This massive report highlights social media usage, strategy and predictions for 2010. And this article will bring you a small look at some of the findings from this content-rich report. By the way, MarketingProfs used a three-tiered approach to craft this study, including consulting with a panel of social media experts, surveying more than 5,000 MarketingProfs readers and asking comScore to mine its panel data. This approach adds greater integrity and scope to the overall results. #1: What’s “Normal” in Social Media Usage? Twitter: Half of the marketers surveyed reported updating at least once per day. Of those, 20.6% actually update several times per day. Facebook: The largest group (33.4%) of marketers are updating “weekly.” However, nearly 30% are updating at least once per day. LinkedIn: Only 11.5% update daily with the overall consensus being weekly updates at 25.4%. What’s hype and what’s fact? Many of the findings in this report touched on some of the frequent hype-versus-fact dialogue taking place in the social media arena. “Is Twitter more popular than Facebook?” “Do companies with no money use ‘earned’ media the most?” and “Do a lot of followers mean social media success?” are some of the questions addressed in the results. Who has higher usage stats, Facebook or Twitter? If you look at the overall number of users, both corporate and consumer (with the exception of certain industries), Facebook comes out ahead of Twitter. Also, about half of all marketers report that their employers or clients actively maintain a corporate Facebook account, while 42.8% reported their employers or clients maintain a Twitter site. Who’s using “free” media? Based on the results of the study, “free” media, also known as “earned” media, is not just for small businesses with no money to spend. The data shows that “it takes money to build and staff earned media marketing materials. The word ‘free’ belongs in quotations for a reason,” says MarketingProfs. 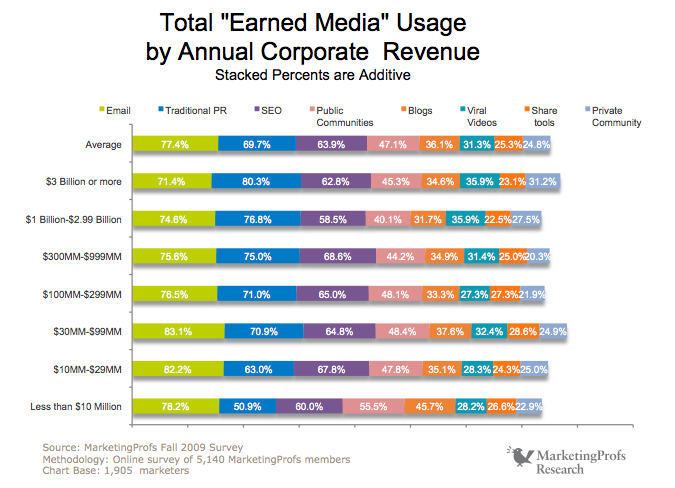 This compares “earned media” usage against annual corporate revenue. Surprisingly it shows a steady usage amount across many of the “earned media” tactics, showing that annual corporate revenues are not necessarily a driving factor for “earned media” usage. Do follower counts really matter? According to the stats, there are three types of Twitter users, the two primary types being “those that value massive follower counts and those that want a very specific set of people to follow them.” And MarketingProfs points out that a third type of Twitter users might be those that want a lot of followers but have no clue how to get them. 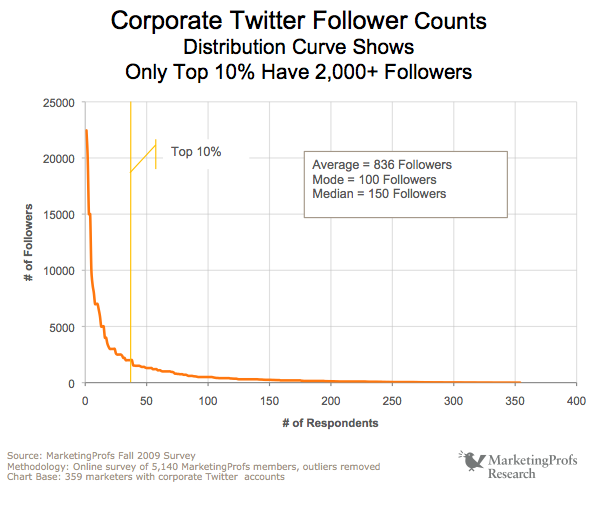 This shows how the number of followers reported by corporate Twitter users is distributed. The steep curves shows that some users care about the quantity of followers while others care more about the quality of followers. Although the report did not touch on the number of fans on corporate Facebook fan pages, it did report on corporate Facebook accounts and the number of friends associated with them. Based on the results, only 6% of Facebook fan pages had 2,000 friends or more. This shows the number of Facebook friends reported by corporate users. Similar to the Twitter graph above, there is a steep curve. 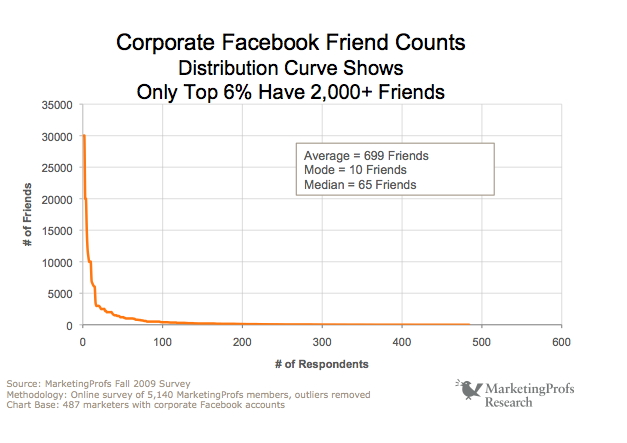 This curve shows that very few marketers (only 6%) have been able to reach the 2,000 friend mark, meaning most marketers fall well below this mark. On Twitter, the two tactics tried the most were 1) driving sales by linking to promotional web pages (72.1% tried it) and 2) driving traffic by linking to marketing web pages (54.2% tried it). On Facebook, the two tactics tried the most were 1) driving traffic to corporate materials with status updates (55.3%) and 2) “friending” recent customers with corporate Facebook profiles (39.2%). Here’s what you really need to know from the report: The least-tried tactics often seem to work the best (something to consider next time you plan a social media campaign!). Pushing data: Companies that only push out their own messages and continually dump links to their promotions are missing out on the responses of their followers and fans. When they do this, they are missing the opportunity to engage and build valuable relationships. This is a sure-fire way to lose followers quickly. Treating social media as a short-term campaign: It is easy to spot the companies that are not in it for the long haul and not interested in long-term relationships—just like the previous point, they are the ones pushing data and ignoring their followers. Thinking Twitter revolves around you: Two great examples of this are Twitter auto-responders triggered by a follow and not following most people following you on Twitter. These actions speak volumes and tell your followers you are in it for you… not them. According to Jason Baer, president of Convince & Convert, we’ll begin to see more case studies showing the integration of social media with other prominent marketing initiatives. For example, we’ll see more examples of how social media integrates with email, banner ads, direct mail and customer service. David Alston, vice president of marketing & community for Radian6, predicts that more people will continue to use social media platforms to express their needs and challenges with companies (instead of calling or writing in their grievances). Alston notes that businesses that embrace this form of communication will have the opportunity to capture market share from those who don’t. Marketers that make listening and engaging the core of how they market will begin to grow in numbers because it is how word of mouth is powered and it is much more effective. The report goes into much more detail and is definitely worth a read. To check it out, go here. So now it’s your turn. What do you think of the findings? Have you or your company been victim to the “counterproductive” social media tactics mentioned above?